You can create invoices during chats with customers using the FreshBooks integration. This allows you to handle the entire sales-related communication on one channel, which will save you and your customers a lot of time on exchanging emails. Log in to LiveChat. 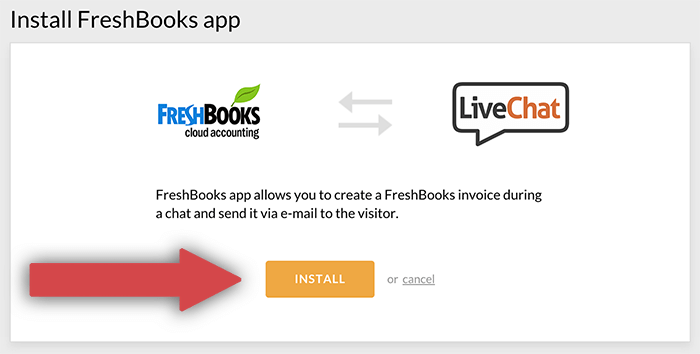 Next, go to the FreshBooks integration page and click on the Install application button. You will need to type in your FreshBooks address. Type it in and click on the Save changes button. From now on, you will be able to create invoices in FreshBooks straight from chat. To do that, click on the More button (in the upper right corner of the window) during a chat with a customer and choose the Create an invoice option.